Scientists may be able to spot evidence of elusive dark matter by detecting vibrations on the surfaces of stars that could indicate that a dark-matter object known as a primordial black hole has passed through the stars, according to the study. The ripples could thus provide observable proof of dark matter, which is thought to make up more than 80 percent of all matter in the universe but has thus far evaded direct detection. "There's a larger question of what constitutes dark matter, and if a primordial black hole were found it would fit all the parameters," study co-author Shravan Hanasoge of Princeton University said in a statement. "Identifying one would have profound implications for our understanding of the early universe and dark matter." "If you imagine poking a water balloon and watching the water ripple inside, that's similar to how a star's surface appears," said lead author Michael Kesden of New York University. "By looking at how a star's surface moves, you can figure out what's going on inside. If a black hole goes through, you can see the surface vibrate." 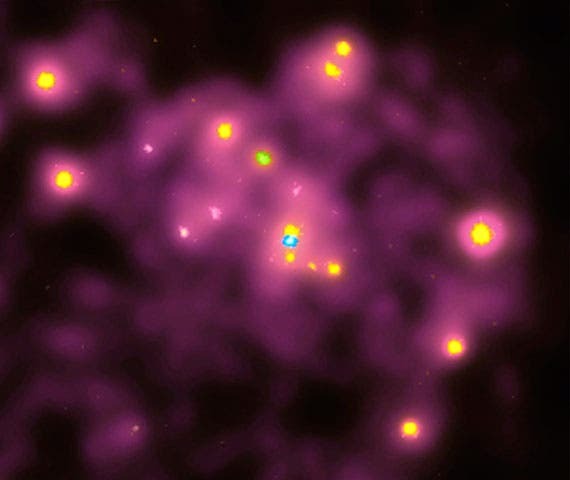 "Now that we know primordial black holes can produce detectable vibrations in stars, we could try to look at a larger sample of stars than just our own sun," Kesden added. "The Milky Way has 100 billion stars, so about 10,000 detectable events should be happening every year in our galaxy if we just knew where to look."